Map It! Okinawa: "The Obscure 'Ato no Utaki' in Kyoda, Nago"
Obscure? Perhaps more of a pun than anything. This Utaki (sacred place) is quite visible from Highway 71...only if you are looking in a certain direction and from a certain place. And you may barely see it from the 58. I speculate that most people driving on the 71 heading west towards Nago tend to be focused on what's straight ahead. This is understandable. You are going downhill at this stage at a good speed. You are almost about to hit the 58. You are wary of oncoming traffic. Even if you are driving eastward, you will more than likely miss it. That's because the way this Utaki is tucked in and masked partly by nature and partly by the overgrowth vegetation along Highway 71. But when you do happen to see it, you may say to yourself, "Wow! I drive through this place all the time and I didn't know that was there!". I posted the photo above purposely to give you an idea what you may see driving along the 71 if you are looking to the north. 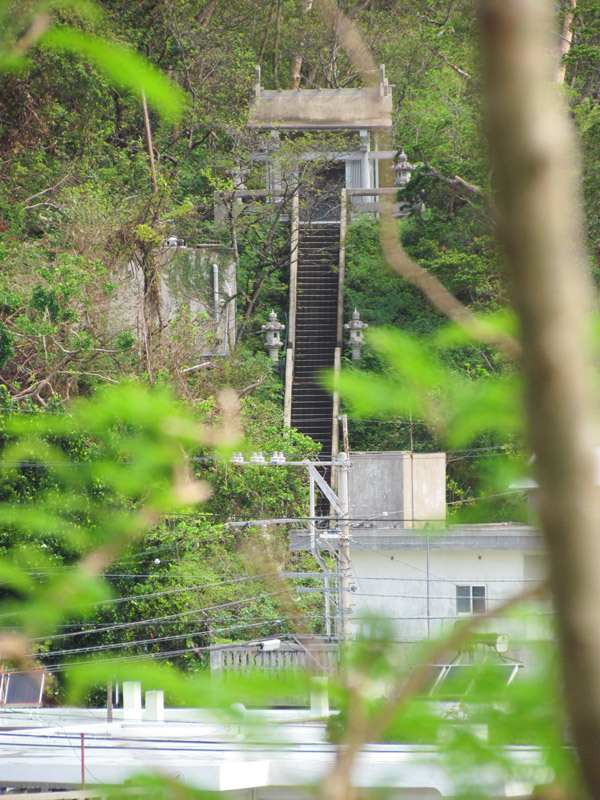 There is a long stairway that leads to this Utaki. At the bottom is a Torii entrance gate. An inscription on the Torii itself says it was donated by the 'Toyota Car Company'. 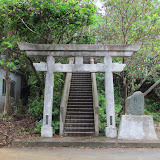 Next to the Torii is a large stone with the Utaki's named inscribed on it. It is called the 'Ato no Utaki'. The word 'Ato' can have several meanings in Japanese. It can mean 'later' or 'after'. I am not positive of the symbolic meaning it may have here. This Utaki looks relatively modern. Inside, were concrete platforms to place ornaments or offerings. It was a very ordinary setup. I'm not certain if the Utaki's location has any historical significance to the town of Kyoda. BUT! perhaps what lies around the corner is why the people of Kyoda chose this location. I used the word 'obscure' earlier to describe the Kyoda Utaki. Well,...what lies close by is really a tiny hole-in-the-wall. If I didn't take time to walk around the corner, I would have never known this little place existed in a 100 years...and I'm willing to bet that most people outside of the town of Kyoda ever heard about it too. It's Kyoda's legendary fountain, called the 'Water from Hands', in which I will blog about very soon. Parking. You will have to find open areas nearby for parking. Be aware that some neighborhood roads are narrow and not advisable you park on them. Other places nearby of interest. Giant Red Shisas in Kyoda, 'Water from Hands' Fountain, Todoroki Waterfall, The Nangusuku Castle Ruins, The Nago Museum.